This is my 6 year old Jada. 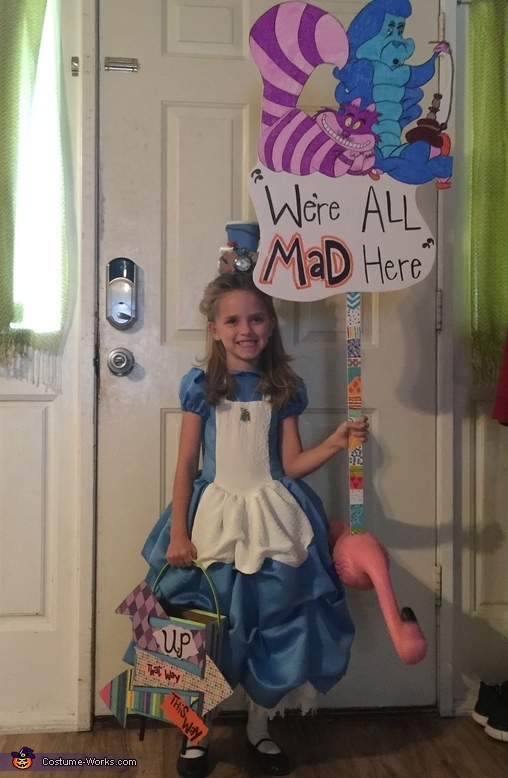 She decided to be Alice after looking at a ton of pictures of different costumes online. I decided she could just be a girl in a simple dress so we vamp it up and her costume portrayed the movie not just the girl. Everything is home made. My husband drew the sign and myself, her grandmother, and her aunt did the other things. She is wearing a homemade necklace with a key, a bottle of small blue shrinking juice, and a card of hearts. Her hat has the rabbits watch, more cards, red roses, and the white fabric looks like the rabbits ears. We use 2 small curlers to get the bumps in the front her hair (like Alice has). The dress was a pattern which was altered In many ways to look like a vamped up Alice dress. Lots of machine and hand sewing. The stick attached to the sign was painted and the flamingo was flipped and glued upside down to portray the croquet sticks used in the movie. We made her trick-or-treat bag by covering an old box with scrapbook paper. I made arrows that are labeled this way, that way, and up To also portray a scene in the movie. All that really really hard work paid off because we all loved it. We hope you do too! !